Ah, the arcade: that glittering portal to dozens of impossible worlds, where adventure and heroism get prized above all. While the titles and technologies have changed since the 70s, some characters remain staples in these childhood haunts. Year after year, they get shot by the same spaceship, stomped by the same hedgehog, or tossed off the same buildings into the same puddle of mud. Being a hero every day might be great, but a villain? Despised by children everywhere, with no recognition for that work? I know I’d long for a change after a while. Wreck-It Ralph opens as Litwak’s Arcade shuts down for the night, when its pixelated inhabitants come alive. This prompts the obvious parallel with Toy Story, and Pixar’s John Lasseter even served as an Executive Producer here. As in the earlier Disney film, these game characters have lives of their own when humans aren’t around, venturing from game to game during the night. How to link these game cabinets and their respective worlds together? Use their power cords as a subway system of course, complete with a Game Central Station. Too cheesy for you? We're just getting started! The film’s eponymous character lives and works as “the bad guy” in the video game Fix-It Felix, Jr., an arcade game modeled in no subtle way after the classic Donkey Kong. In the game, the player takes the role of carpenter Felix (Jack McBrayer) and repairs the damage done to an apartment building by an angry, destructive Ralph (John C. Reilly). Heavy-set, long-armed, and in reality a friendly fellow, Ralph longs to feel respected and included by Felix and the apartment’s tenants. They can't see past his violent, villainous role in the game, claiming that wrecking things is his nature and that he's unfit to mingle with the good guys. Determined to prove them wrong, Ralph sets out to make a name for himself as a hero in one of the arcade's other games. His journey takes him from a sci-fi first person shooter called Hero's Duty (perhaps the only reference less subtle than Ralph's own game) to a racing game called Sugar Rush (the eye-popping lovechild of Candyland and Mario Kart). Ralph runs into a wide range of over-the-top characters in each of these worlds. 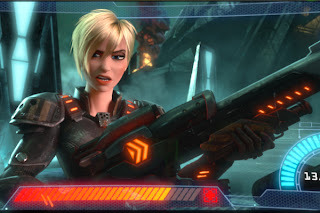 One standout is Sergeant Calhoun, a blonde, bug-zapping soldier voiced by Glee’s Jane Lynch, whose biting one-liners make me wish she got more screen time. Slightly less impressive, yet more central to Ralph’s adventures, is Sarah Silverman’s turn as Vanellope von Schweetz, the bubbly little girl who wants to join in the races of Sugar Rush. She infuriates more than one character in the process, including Alan Tudyk’s diabolical despot King Candy. Silverman’s humour has dropped down to PG for the sake of the children, yet her character still manages to capture her uniquely childish ability to be both annoying and endearing. As this is still a movie ultimately aimed at kids, each character leans heavily on several simplistic tropes (the misunderstood brute, the bullied little misfit, the tough soldier with an excessively depressing backstory). 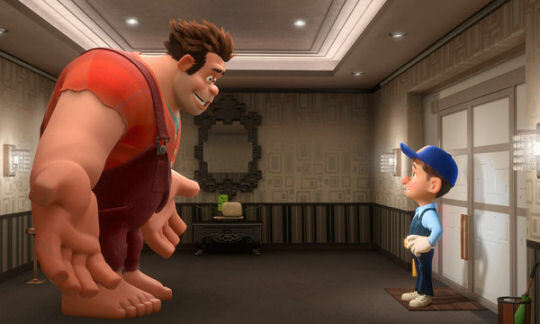 Besides the obvious (and profitable) play for parental nostalgia, Wreck-It Ralph includes many themes that resonate from our childhood: the desire to belong, to succeed. A challenge to the roles good and evil also features, though I would loved to have seen it fleshed out in a more nuanced way than just 'Bad Guys Can Be Good' and vice versa. Despite this simplicity, screenwriters Phil Johnston and Jennifer Lee still weave in some rich character relationships. While the unlikely friendships and romances here are all somewhat simplified, they still give the film an affecting heart, and more than one person in my theatre appeared choked-up during the film's third act. Even incidental characters seem carefully chosen to go for maximum appeal: it warmed my heart to see a bespectacled little girl at the control of the arcade games, happy to wander around popping quarters into everything from shooters to platformers to... damn it, Disney, you latched on to my heartstrings again. If you can make me cry over some ridiculous fish, what chance to I stand here? Even if my gushing over gaming lore sounds foreign to you, the visuals in Wreck-It Ralph are ... well ... eye candy. More than one richly rendered sequence, paired with the pulse-spiking music that's true to each game’s genre, made me giddy. While most movement came fluidly and didn’t distract, some characters were made to move in the stilted, freeze-frame manner of their games. This nice touch along with myriad cameos and others small details demand a repeat viewing, and remind us why animation can be so uniquely powerful in crafting worlds and characters. It also allowed for some rather famous mascots to appear alongside our heroes. In case the poster didn’t tip you off, Wreck-It Ralph features product placement and character licenses up the wazoo. I don't know what legal hoops Disney had to jump through for this one (in light of recent news I rather hoped for a Darth Vader cameo, but alas). Unlike a lot of movies where shots of big brand labels look shoehorned and ridiculous, seeing real games in the arcade gave the place a sense of authenticity. Wedging the Fix-It Felix, Jr. cabinet between Pac-Man and Asteroids was no accident. These familiar titles give Litwak’s Arcade a realism that even those not familiar with classic arcades will still be able to pick up, while signalling gamers in the crowd that the filmmakers are keen to speak our language. Seeing video game legends on the big screen was part of the draw for much of the audience, myself included, as gaming geeks don't get a lot of positive representation in movies – let alone something like Wreck-It Ralph. Thematically and visually, it seems to have been gift-wrapped for a nostalgic geek parent in search of a kid's movie that they'll enjoy too. 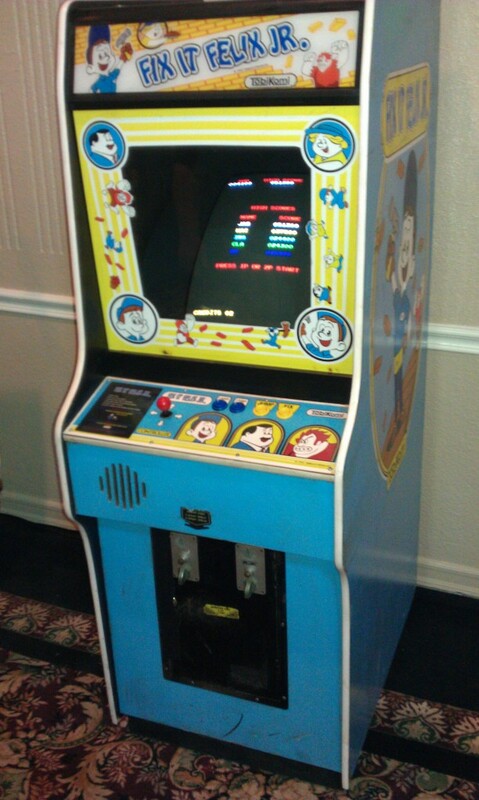 Just in case traditional marketing weren't enough to sell this made-up game to the old-school gamer, Disney built some real life Fix-It Felix Jr. arcade machines and stuck them in strategic locations – i.e. arcades and video game conventions. I spotted one at Fan Expo in Toronto in August, with a respectable line of gamers, young and old, looking to try out this clever promotional contraption. When you win, you get to see poor Ralph chucked off the roof of the apartment complex by its inhabitants... something played out in the film’s opening scene. The film’s subject matter makes it perfectly suited to a transmedia ad campaign; watching Ralph going through the paces in his own game before seeing the movie adds an extra level of engagement for the audience. Wreck-It Ralph is a short, yet sweet ride, clocking in at a satisfying 108 minutes. So if you need entertain your inner kid, or have kids of your own, give it a look; it may not be an oldie, but it’s a goodie. – Catharine Charlesworth is an avid lover of books, the web, and other inventive outlets for the written word. 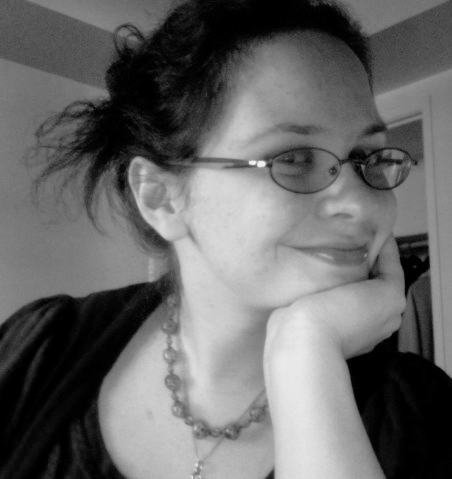 She has studied communication at the University of Toronto while working as a bookseller, and is currently employed in online advertising in downtown Toronto.